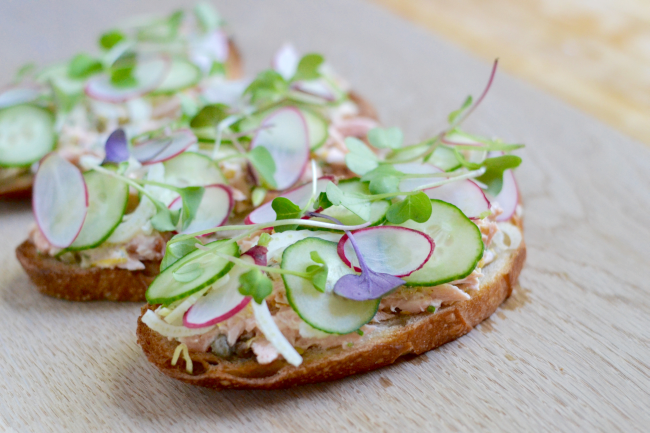 Smoked wild salmon tartine! I was tasked to make a few recipes using a Traeger grill. And because I’m a little different, I wanted to make something a little different. That being said, check out this recipe! It’s an awesome meal, snack or hors d’oeuvre. Whatever you want. First you need to smoke the salmon. You’ll need four, 6oz boneless/skinless wild salmon pieces. Rub them with olive oil, salt and pepper. The oil will help to capture the smokey flavor. Put the salmon in a cast iron pan and place it in the Traeger while it’s cold. Use oak pellets and set the grill to “smoke”. I noticed that the best (thick white) smoke comes at the lowest setting. 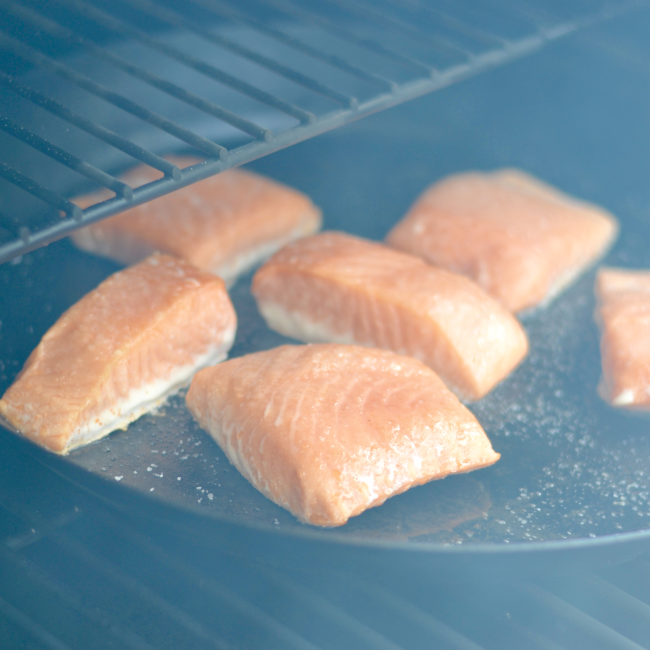 Smoke the fish for about 15 minutes or to an internal temperature of about 150f. Keep the lid closed as much as your curiosity will permit. When the fish is done, chill it thoroughly. Turn the Traeger up to high heat. all four 6oz pieces of your beautifully smoked wild salmon, broken into flakey pieces. Carefully mix everything together. 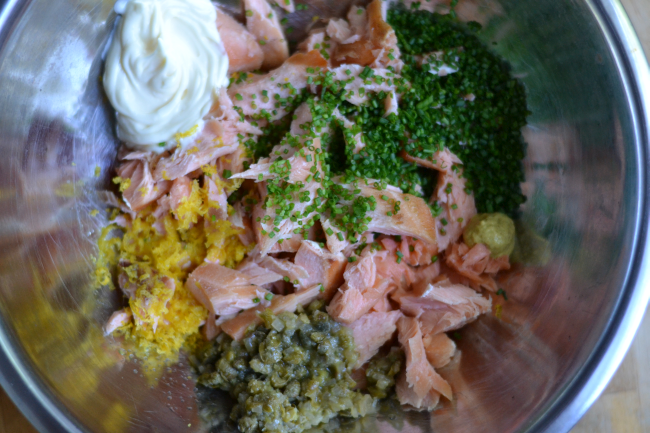 Try to maintain the integrity of the salmon – don’t mash it up too much. Season the mixture with salt and cracked pepper. Next, you will want to grill the toast. Slice six, long pieces of french bread about a half an inch thick. Drizzle the bread with olive oil and sprinkle on a little salt. 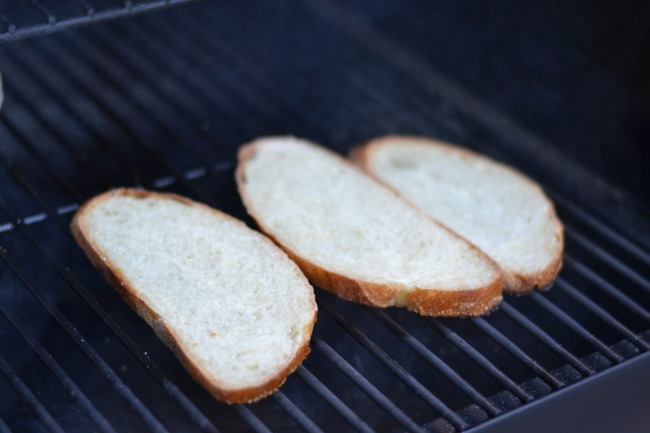 Grill the bread on the Traeger until it’s crisp on the outside but still a little soft on the inside. Now we’ll put it all together. 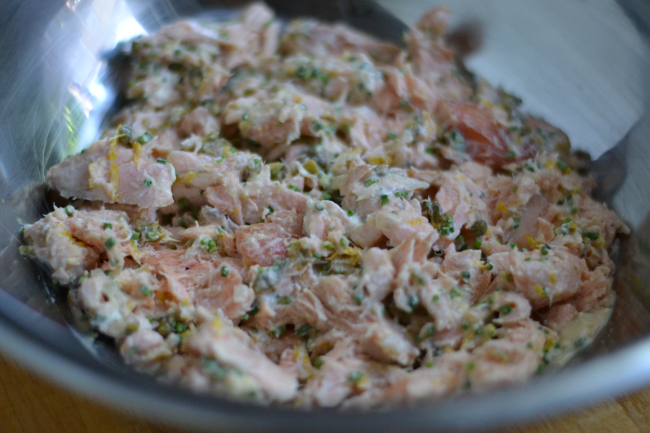 Top each piece of toast with a nice, even layer of the salmon salad all the way to the edges. Using a mandolin slicer, shave some radishes, fennel, and english cucumber. Scatter the radishes, fennel and cucumber on top of the salmon and garnish with radish sprouts.